Sometimes it’s about the mind-blowing terrain. Sometimes it’s about the colorful wildflowers. And sometimes it’s about the endurance – just getting it done. Today, I’d have to say my hike was all about the clouds. 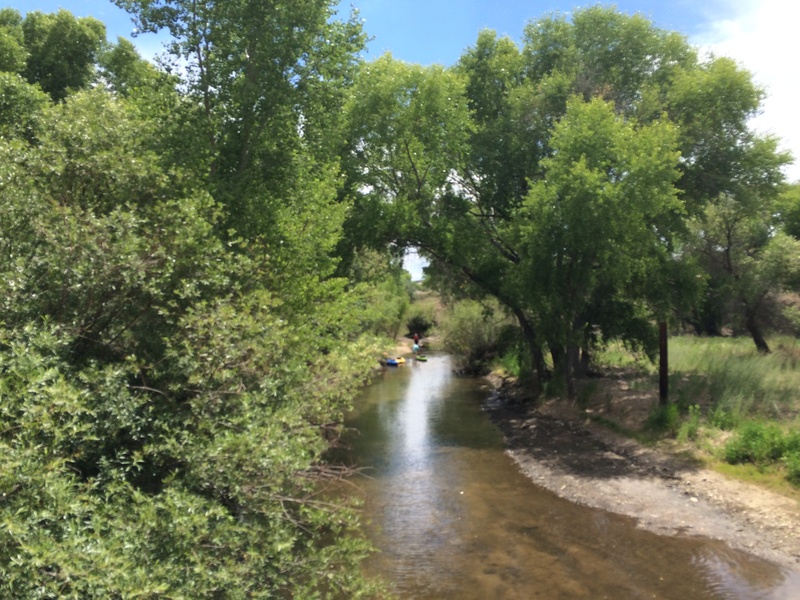 In northern Arizona, there’s a sweet spot in hiking – that stretch in June, when the temperatures warm to the 80s and 90s, the trees are in full bloom, and the summer monsoon rains have yet to start. 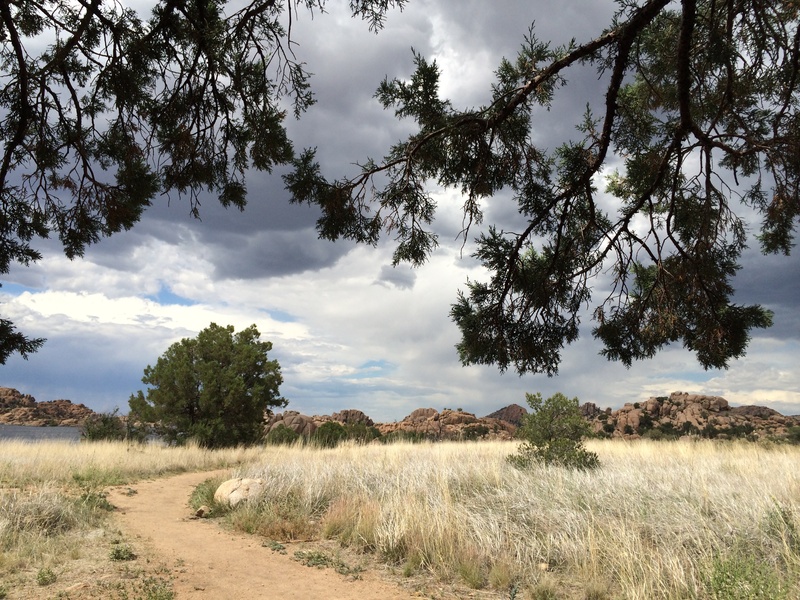 I call it the “pre-monsoonal season.” For the most part, you can plan a hike or other outdoor activity without too many worries about getting caught in a violent thunderstorm. Still, as the dew point rises, and the conditions work gradually up to the monsoon, you’re sure to get some amazing clouds. It was that kind of day today. As soon as I opened my front door and felt the slightly muggy air (for arid Arizona anyway), I knew the clouds would be cropping up – white and puffy – everywhere. 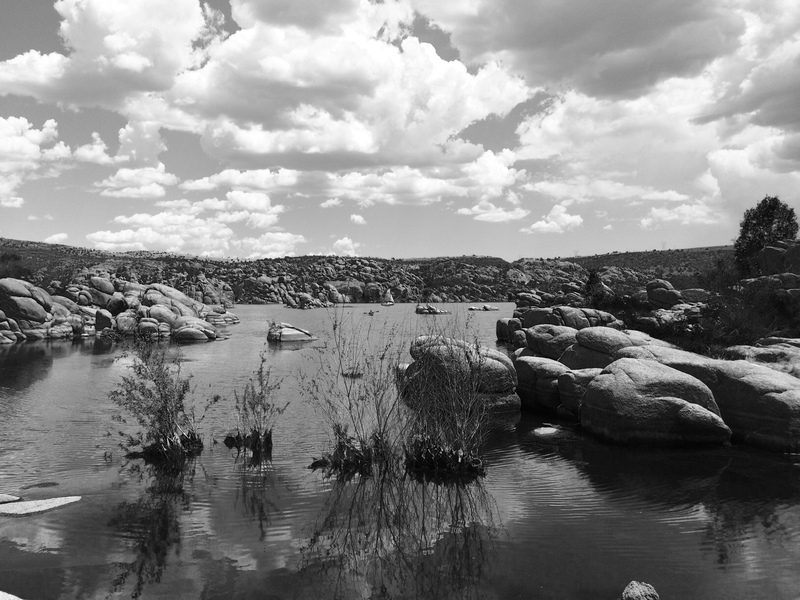 I headed to Watson Lake in Prescott, where the orange-hued Granite Dells serve as a stunning backdrop for the blue skies and cottony clouds. 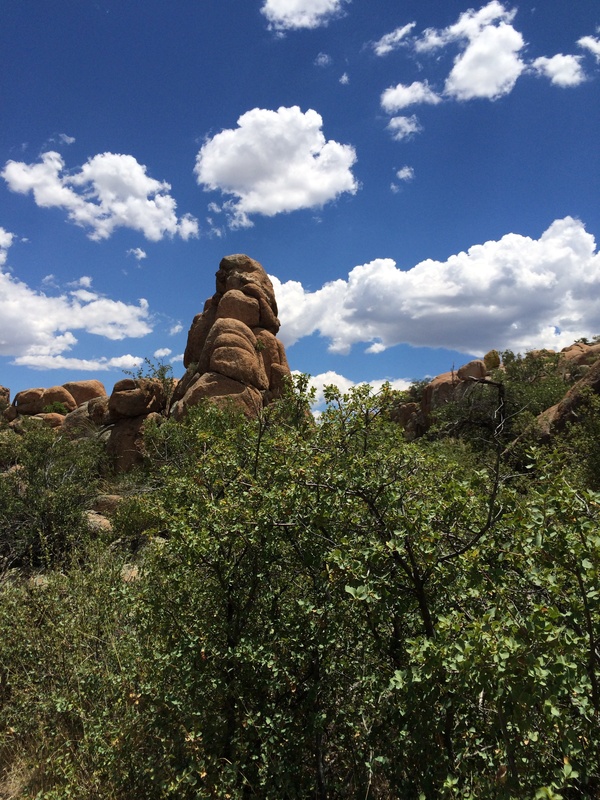 The six-mile Watson Lake loop is a nice – if fairly tough – hot-day hike, with plenty of ups and downs, interspersed with flat, shady stretches. 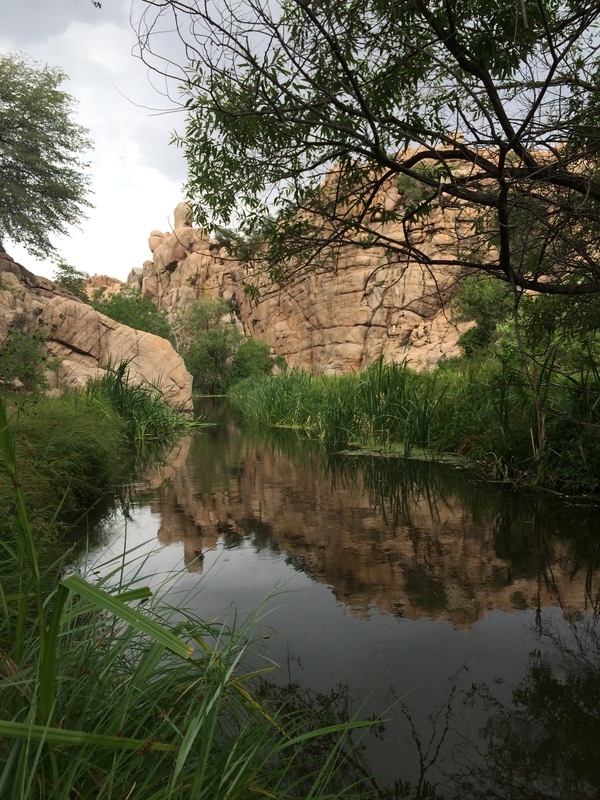 There are several places to start (the trailhead of the Peavine Trail off Sundog Ranch Road, the Highway 89 Watson Lake overlook, the Highway 89A Peavine trailhead near Granite Dells Parkway), but I like to start at the trailhead of the Flume Trail, off Granite Dells Road, via Highway 89. 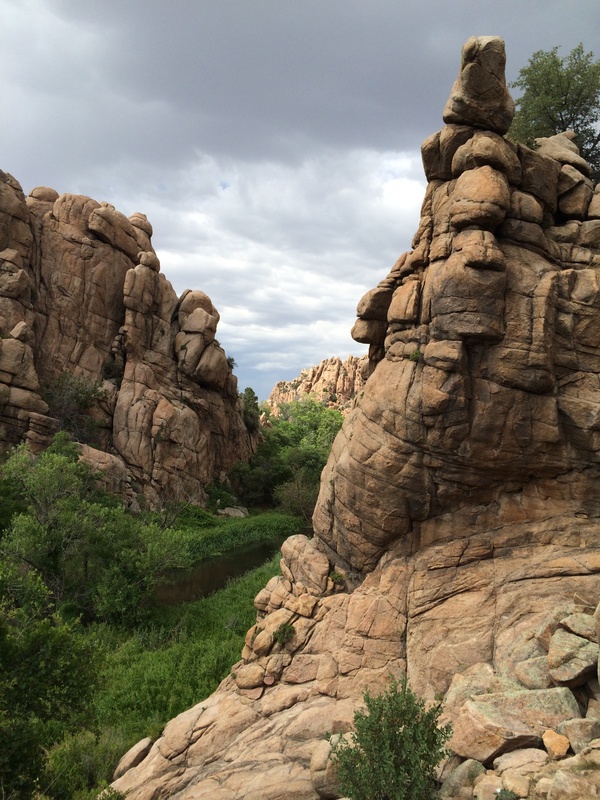 From there, the trail squeezes through steep rock walls, and gives hikers plenty of choices. 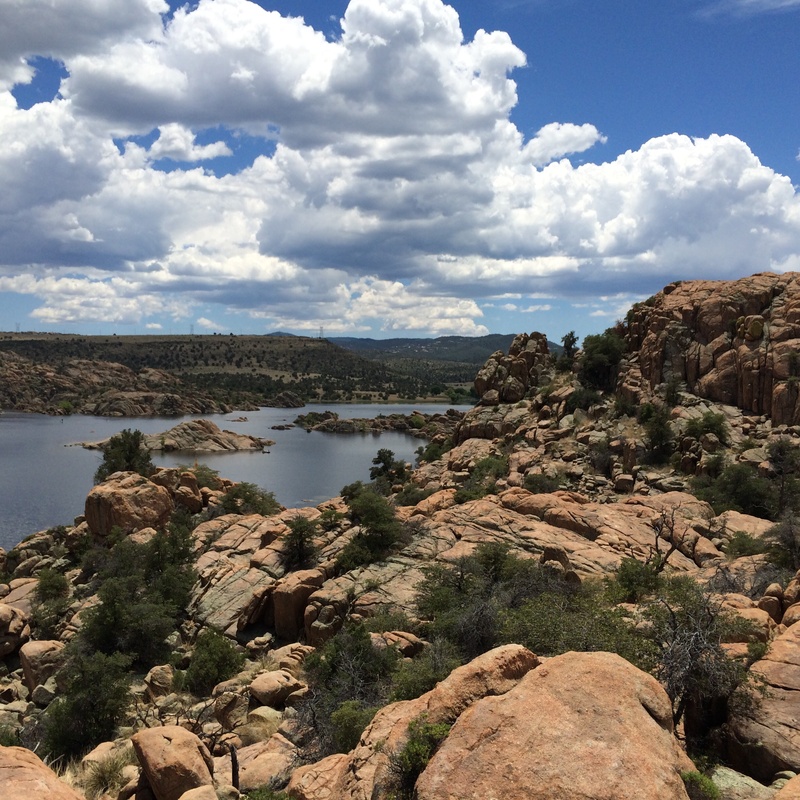 Stay along the Watson Lake Dam trail (to the right), and you’ll have continuous views of lake – oh, and the clouds! 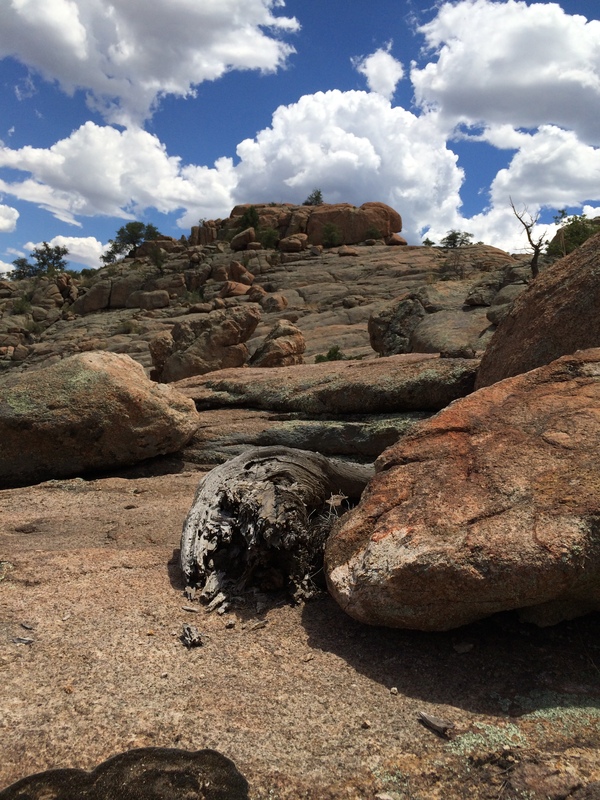 As I continued along the trail, I noticed the changing character of the clouds. At first, around noon, the clouds were pure white, hanging prettily in the deep blue sky. But as I progressed along the trail, the clouds began to change – going from white to light gray, and finally to an ominous dark gray. By the time I reached the Over the Hill Trail, which I think is the toughest part of the loop, the clouds filled the sky, and I felt an occasional raindrop. As I expected, though, the clouds never yielded any real rain, and I was able to finish the hike without getting doused. The changing clouds did bring with them a sweet, cool breeze, which helped after the hour or two of brutal sunlight. Since 2015 has been a fairly wet year, the monsoons could actually begin sooner than the usual July 4 start. It pays to keep a close eye on the weather reports when planning hikes in northern Arizona, since no one likes being caught on a mountainside in a blazing lightning storm. I don’t anyway. I will continue to take advantage of the pretty clouds, though.